Mordred, an iron-fisted warlock, and his armies lay siege to Camelot, seeking to establish the dominance of mages over humankind. Uther Pendragon, king of the Britons, infiltrates Mordred's lair and beheads him, saving Camelot. Uther's treacherous younger brother Vortigern, who covets the throne, orchestrates a coup and sacrifices his wife Elsa to moat hags to become a demon knight, who kills Uther's wife Igraine and slays Uther in combat. The only survivor is Uther's son Arthur, who drifts away in a boat and ends up in Londinium, where he is found and raised by prostitutes. Arthur grows into a skilled fighter and man of the streets. Arthur and his friends confront a group of Vikings who had mistreated one of the prostitutes, forcing them to pay her restitution. Afterwards, the brothel is raided by the Blacklegs, Vortigern's minions, and Arthur learns that the Vikings were under the king's protection. Arthur tries to escape the city but is caught and put on a ship with hundreds of other men; the Blacklegs have been forcing all men of Arthur's age to try to pull a sword that has appeared near the castle from the surrounding stone. Arthur is able to remove the sword but is quickly overwhelmed by its power and passes out. Vortigern meets with him in the dungeon, revealing his true lineage. Meanwhile, a mage identifying herself as an acolyte of Merlin presents herself to Uther's former general, Sir Bedivere. At Arthur's planned execution, the mage uses her magic to stage a diversion while Bedivere's men rescue Arthur. Taken to Bedivere's hideout, Arthur initially refuses to help them. The mage persuades Bedivere to take Arthur to a realm called the "Darklands," where he's given a vision of how Uther sacrificed himself to save Arthur and entomb the sword in stone. Arthur learns Vortigern was responsible for persuading Mordred to rebel against humanity, and he returns determined to destroy Vortigern. With his friends and Bedivere's men, Arthur stages a series of ambushes against Vortigern, culminating in an assassination attempt in Londinium. The rebels sense a trap but attack anyway, fleeing to a fighters' school run by Arthur's mentor George, where they are overrun by the Blacklegs. Seeing the mage held at knifepoint, Arthur unleashes Excalibur's potential, single-handedly killing all of the soldiers and allowing most of the rebels to escape the city. However in the ensuing chaos, Arthur's close friend Back Lack is wounded and murdered by Vortigern in front of Arthur and Back Lack's son later that night. Ashamed of his failures, Arthur tries to throw away the sword, but the Lady of the Lake returns it and shows him a vision of England's future under Vortigern's rule. Coming to terms with his responsibility, Arthur reunites with Bedivere. When they return to the rebel hideout, however, they discover all of their allies dead, Vortigern having found them and delivered an ultimatum: if Arthur does not surrender himself, the captured mage will die. Arthur surrenders himself, but as Vortigern is about to execute his nephew, a giant snake summoned by the mage attacks and devours Vortigern's men. While Bedivere and the others lead an attack on the castle, a desperate Vortigern sacrifices his only daughter and is transformed into the demon knight, confronting Arthur in a separate dimension. Despite his fighting skill, Arthur is beaten, and he is about to submit when he witnesses a vision of his father, convincing him to accept the sword and his character as his own. Arthur violently slays Vortigern but blesses him as he dies. In the aftermath, Arthur dissolves Vortigern's pact with the Vikings and begins building a Round Table where his knighted friends will meet. Blue and the prostitutes arrive with the crown of Uther, which Arthur accepts, holding the sword aloft. Charlie Hunnam as King Arthur, Uther's son, Vortigern's nephew and the would-be king of Britain who was raised by prostitutes. Jude Law as Vortigern, Uther's brother, Elsa's husband, Catia's father, Arthur's uncle and the tyrannical ruthless king of Britain. Àstrid Bergès-Frisbey as the Mage, a woman working for Merlin who supports Arthur and the resistance. Djimon Hounsou as Sir Bedivere, the leader of the resistance and a former knight of Uther. Aidan Gillen as Goosefat Bill Wilson, a skilled archer, Bedivere's friend, former knight of Uther and member of the resistance. Eric Bana as Uther Pendragon, Vortigern's brother, Arthur's father and the king of Britain. Kingsley Ben-Adir as Sir Tristan "Wet Stick", Arthur and Back Lack's childhood friend who is later knighted by Bedivere. Craig McGinlay as Sir Percival, a member of the resistance who is later knighted by Bedivere. Tom Wu as Sir George, Arthur's mentor and a skilled fighter who helps the resistance and is later knighted by Bedivere. Neil Maskell as Back Lack, Arthur and Tristan's childhood friend and Blue's father, who helps the resistance. Annabelle Wallis as Maggie, Vortigern's maid who helps the resistance. Katie McGrath as Elsa, Vortigern's wife. Freddie Fox as Rubio, a member of the resistance who later betrays them under torture and helps Vortigern. Bleu Landau as Blue, Back Lack's son. Mikael Persbrandt as Greybeard, a Viking who has deals with Vortigern. Poppy Delevingne as Igraine, Arthur's mother and Uther's wife. Millie Brady as Catia, Vortigern's daughter. Lorraine Bruce, Eline Powell and Hermione Corfield as the three Syrens. Michael McElhatton as Jack's Eye, Arthur's scout on the kingdom. After 2004's King Arthur, Warner Bros. made multiple attempts to make a new film based on Arthurian legend: one was a remake of Excalibur, helmed by Bryan Singer, while the other was a film titled Arthur & Lancelot, which would have starred Kit Harington and Joel Kinnaman in the title roles respectively. Warner Bros. worried that neither names were big enough, and attempted to replace both actors with more profitable ones, before eventually dropping the project altogether. Warner's next attempt to create a new King Arthur film was an attempt to create an Arthurian cinematic universe which would span six films, following different characters before their eventual team up. For this endeavour they hired director Guy Ritchie, who has himself attempted to make a King Arthur movie prior to that. According to The Guardian, the script soon became "a strange Frankenstein's Monster-style screenplay" incorporating elements from several of the unproduced Arthurian scripts. Hunnam at the 2016 San Diego Comic-Con International, to promote King Arthur: Legend of the Sword. 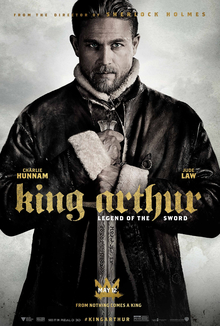 In August 2014, Charlie Hunnam, Ritchie's choice for the role, was cast to play King Arthur. Elizabeth Olsen was in talks for the female lead, but on 18 September, Àstrid Bergès-Frisbey landed the role instead. On 14 November, Jude Law was in talks to play the lead villain role in the film. On 11 February 2015, Eric Bana was added to the cast to play Uther, the father of King Arthur. Mikael Persbrandt joined the film on 6 March 2015, to play a villainous role. Although there were reports Idris Elba had been cast, he would confirm, in a Reddit AMA, this was a rumour. Filming in Windsor Great Park was underway in February 2015, then later in North Wales from 2 March 2015. Later on 10 March 2015, Ritchie tweeted a photo and confirmed the first day of shooting. In April 2015, filming took place in Snowdonia, where locations used were Tryfan, Nant Gwynant near Beddgelert and Capel Curig. Early in July filming continued in the Shieldaig, Loch Torridon and Applecross areas of Wester Ross in the Scottish Highlands. One day of filming also took place at The Quiraing on the Isle of Skye. Filming also took place at Warner Bros. Studios, Leavesden. In April 2014, Warner Bros. set the film for a 22 July 2016 release, alongside Lights Out, but it was then moved by Warner Bros. to 17 February 2017, alongside Maze Runner: The Death Cure. Warner Bros. moved the release date to 24 March 2017. The title was changed to King Arthur: Legend of the Sword in July 2016. In December 2016 the release date was again moved, this time to 12 May 2017, possibly so as not to compete with CHiPs. The trailer was released on 23 July 2016, during the 2016 San Diego Comic-Con and was attached to screenings of Mechanic: Resurrection, Don't Breathe, Shut In and Fantastic Beasts and Where to Find Them. It was originally planned for an IMAX release on 22 July 2016, as evident in the Comic-Con trailer, but was cancelled due to it being postponed and only received non-IMAX presentations. The first extended TV spot was released on 22 January 2017, and was shown on the 2017 NFC Championship Game on Fox Broadcasting Company between the Atlanta Falcons and the Green Bay Packers and the 2017 AFC Championship Game on CBS between the Pittsburgh Steelers and the New England Patriots. A second trailer was released on 20 February 2017 and was attached to Logan, Kong: Skull Island, Power Rangers and Ghost in the Shell. The third and final trailer was released on 1 April 2017 and was attached to The Fate of the Furious, The Lost City of Z (which also starred Hunnam) and Free Fire. All in all, Warner Bros. spent $135 million on marketing the film. The film was shown at select AMC Theatres in a special preview on 27 April 2017, in a promotional event titled "King for a Day." Demand for tickets led AMC to expand the event to 200 theatres. King Arthur: Legend of the Sword was released on DVD, Blu-ray, 3D Blu-ray and Ultra HD on 8 August 2017. King Arthur: Legend of the Sword grossed $39.2 million in the United States and Canada and $107 million in other territories for a worldwide total of $146.2 million, against a production budget of $175 million. Deadline Hollywood calculated the film lost the studio $153.2 million, when factoring together all expenses and revenues. In North America, the film was released alongside Snatched and was initially projected to gross around $25 million from 3,702 theatres during its opening weekend. It made $1.15 million from Thursday night previews at about 3,200 theatres, but after making just $5.3 million on Friday, weekend projections were lowered to $15 million. It ended up debuting to $15.4 million, finishing third at the box office. Deadline Hollywood noted that due to the film's $175 million production budget, as well as at least an additional $100 million spent on marketing, the film was destined to be a box office bomb. Regarding the cost of the film, the site quoted one finance expert as saying: "Make original IP [intellectual property] for a cost effective price. If it works then spend more if necessary on the sequel. King Arthur should have been done for $60–80 [million]. Warner Bros. had no reason to spend $175M-plus on this picture." Comparing its opening to cost, IndieWire called the film's failings "historic". The Hollywood Reporter noted that the film would likely lose about $150 million. In its second weekend the film grossed $7.2 million (a drop of 53.5%), finishing 5th at the box office. The film debuted at No. 1 in an estimated 29 countries, including Russia, with openings to follow in the United Kingdom, France, South Korea and Australia. Over its opening weekend, it made only $29.1 million worldwide, in 51 non-American countries. On review aggregator website Rotten Tomatoes, the film has an approval rating of 31% based on 242 reviews and an average rating of 4.7/10. The site's critical consensus reads, "King Arthur: Legend of the Sword piles mounds of modern action flash on an age-old tale – and wipes out much of what made it a classic story in the first place." On Metacritic, the film has a score 41 out of 100 based 45 critics, indicating "mixed or average reviews". Audiences polled by CinemaScore gave the film an average grade of "B+" on an A+ to F scale, while PostTrak reporter filmgoers gave it an overall positive score of 78%; 56% of the opening weekend filmgoers were under the age of 35, and 59% were men. Writing for The Guardian, Peter Bradshaw gave the film a generally positive review: "Guy Ritchie’s cheerfully ridiculous Arthur is a gonzo monarch, a death-metal warrior-king. Ritchie’s film is at all times over the top, crashing around its digital landscapes in all manner of beserkness, sometimes whooshing along, sometimes stuck in the odd narrative doldrum. But it is often surprisingly entertaining, and whatever clunkers he has delivered in the past, Ritchie again shows that a film-maker of his craft and energy commands attention, and part of his confidence in reviving King Arthur resides here in being so unselfconscious and unconcerned about the student canon that has gone before." In a pan of the film for the Chicago Tribune, Michael Phillips questioned the long-term longevity of the projected series of six Arthur films from Ritchie: "I'm no businessman, but plans for a six-film franchise may be optimistic. Optimism is nowhere to be found in Ritchie's movie itself. It is a grim and stupid thing, from one of the world's most successful mediocre filmmakers, and if Shakespeare's King Lear were blogging today, he'd supply the blurb quote: 'Nothing will come of nothing.'." Matt Zoller Seitz of RogerEbert.com gave the film one-and-a-half out of four stars, stating that despite the potential for a revisionist King Arthur story with "[t]he Ritchie sense of style", the overall problem is the film's lack of modulation: "Ritchie keeps rushing us along for two hours, as if to make absolutely certain that we never have time to absorb any character or moment, much less revel in the glorious, cheeky ridiculousness of the whole thing." Alissa Wilkinson of Vox writes that the film is "surprisingly good, and surprisingly political" in relation to the British withdrawal from the European Union, and "occasionally, it's even pretty great". Chris Hartwell of The Hollywood Reporter expressed disappointment in the film's lackluster box office performance denying a sequel for the introduction of Merlin, stating it would have been more successful as a solo film instead of setting up a franchise. ^ a b c d e "Film releases". Variety Insight. Archived from the original on 1 April 2017. Retrieved 11 November 2017. ^ "King Arthur: Legend of the Sword". AMC Theatres. Retrieved 28 April 2017. ^ a b c "King Arthur: Legend of the Sword (2017)". AllMovie. Retrieved 12 May 2017. ^ a b Faughnder, Ryan (9 May 2017). "'King Arthur: Legend of the Sword' poised for soft box office opening as 'Guardians' rules". Los Angeles Times. ^ a b "King Arthur: Legend of the Sword (2017)". Box Office Mojo. Retrieved 24 September 2017. ^ Jenkins, Mark (11 May 2017). "'King Arthur: Legend Of The Sword': An Edgy Script, Dulled By CGI". NPR. Retrieved 17 May 2017. ^ a b c d "'King Arthur's Head Cut Off With $14.7M Opening As 'Snatched' Swims To $17.5M in A 'Guardians'-Ruled Mother's Day Weekend". Deadline Hollywood. 15 May 2017. Retrieved 15 May 2017. ^ a b McClintock, Pamela (15 May 2017). "Box-Office Meltdown: 'King Arthur' Could Lose $150M After Falling on Its Sword". The Hollywood Reporter. ^ "Plans for King Arthur franchise are 'dead'". ^ a b c d White, Adam. "The fall of Camelot: how Guy Ritchie's King Arthur became a $175 million box office bomb". The Guardian. Retrieved 11 August 2017. 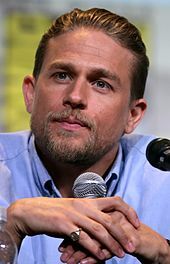 ^ "'Sons of Anarchy's Charlie Hunnam Is Guy Ritchie's Choice For King Arthur". Deadline Hollywood. ^ McNary, Dave; Kroll, Justin (27 August 2014). "Charlie Hunnam to Play King Arthur for Guy Ritchie". Variety. ^ Kit, Borys (18 September 2014). "'King Arthur' Finds Guinevere With 'Pirates of the Caribbean' Actress". The Hollywood Reporter. Retrieved 19 September 2014. ^ Kroll, Justin (14 November 2014). "Jude Law Circling Villainous Role in Guy Ritchie's King Arthur Film". Variety. Retrieved 16 November 2014. ^ Kroll, Justin (11 February 2015). "Eric Bana to Play King Arthur's Father in 'Knights of the Round Table' (EXCLUSIVE)". Variety. Retrieved 15 February 2015. ^ Ford, Rebecca (6 March 2015). "Guy Ritchie's 'King Arthur' Adds Swedish Actor Mikael Persbrandt". The Hollywood Reporter. Retrieved 7 March 2015. ^ "Idris Elba Eyes Guy Ritchie's 'King Arthur' at Warner Bros". Variety. 21 July 2014. Retrieved 23 July 2014. ^ Freeman, Molly. "Idris Elba Talks Luke Cage & Debunks 'King Arthur' Casting Rumor". Screenrant. Retrieved 11 August 2017. ^ Phillip Williams. "Vans & signs left after filming (C) Phillip Williams : Geograph Britain and Ireland". geograph.org.uk. Retrieved 2 February 2016. ^ "On the Set for 3/2/15: Matthew McConaughey & Gugu Mbatha-Raw Start 'Free State of Jones', 'Kickboxer' Wraps & More". ssninsider.com. 2 March 2015. Archived from the original on 5 March 2015. Retrieved 7 March 2015. ^ Crump, Eryl (10 April 2015). "Filming of Hollywood movie King Arthur set to start in Snowdonia". dailypost.co.uk. Retrieved 12 April 2015. ^ Anthony D'Alessandro (21 December 2015). "Guy Ritchie's King Arthur Film Gallops To 2017, 'Lights Out' On July 22, 2016: WB Release Date Changes". Deadline Hollywood. Retrieved 22 December 2015. ^ McNary, Dave (7 December 2016). "Charlie Hunnam's King Arthur Movie Pushed Back to March 2017". Comingsoon.net. Retrieved 7 December 2016. ^ "Warner Bros. Pictures Comic-Con Plans Announced!". 11 July 2016. Retrieved 12 July 2016. ^ "Guy Ritchie's King Arthur Has A New Release Date, And It's Brutal". CinemaBlend. 7 December 2016. Retrieved 24 April 2017. ^ "Warner Bros. Shifts King Arthur, CHiPS & Annabelle 2 Release Dates". screenrant.com. 7 December 2016. Retrieved 24 April 2017. ^ "King Arthur: Legend of the Sword in IMAX". imax.com. Retrieved 24 April 2017. ^ D'Alessandro, Anthony (20 April 2017). "'King Arthur: Legend Of The Sword' Advance Previews In Huge Demand; AMC Ups Theater Count". Deadline Hollywood. Retrieved 24 April 2017. ^ "King Arthur: Legend of the Sword". Amazon.com. 8 August 2017. Retrieved 30 June 2017. ^ D'Alessandro, Anthony (29 March 2018). "What Were The Biggest Bombs At The 2017 B.O.? Deadline's Most Valuable Blockbuster Tournament". Deadline Hollywood. Retrieved 29 March 2018. ^ "'King Arthur' Delivers $1.15M from Thursday Previews, 'Snatched' Takes in $650k". Box Office Mojo. 12 May 2017. ^ "Box-Office Bomb: 'King Arthur' Opens to Disastrous $15M Behind 'Snatched'". The Hollywood Reporter. Retrieved 18 August 2017. ^ "'King Arthur: Legend of the Sword' is a Failure, and Summer Box Office Could Follow". IndieWire. 14 May 2016. ^ "Moviegoers Make $40M Pact With 'Alien: Covenant', 2nd Best Debut For Sci-Fi Series". Deadline Hollywood. 22 May 2017. ^ Schwartzel, Erich (14 May 2017). "'King Arthur' Movie Falls on Its Sword in Opening Weekend". The Wall Street Journal. ^ "King Arthur: Legend of the Sword (2017)". Rotten Tomatoes. Retrieved 1 November 2018. ^ "King Arthur: Legend of the Sword reviews". Metacritic. Retrieved 2 June 2017. ^ Bradshaw, Peter (9 May 2017). "Review of Guy Ritchie's King Arthur". The Guardian. London. Retrieved 18 May 2017. ^ Phillips, Michael (9 May 2017). "'King Arthur' review: Guy Ritchie's ridiculous tale a far cry from Camelot". Chicago Tribune. Retrieved 23 July 2018. ^ Seitz, Matt Zoller (12 May 2017). "King Arthur: Legend of the Sword Movie Review (2017)". RogerEbert.com. Retrieved 14 May 2017. ^ Hartwell, Chris (14 May 2017). "How 'King Arthur' Was Killed by a Would-Be Franchise". The Hollywood Reporter. Retrieved 23 July 2018. This page was last edited on 28 March 2019, at 21:42 (UTC).